Sony has launched its UHS-II SD card in India today. 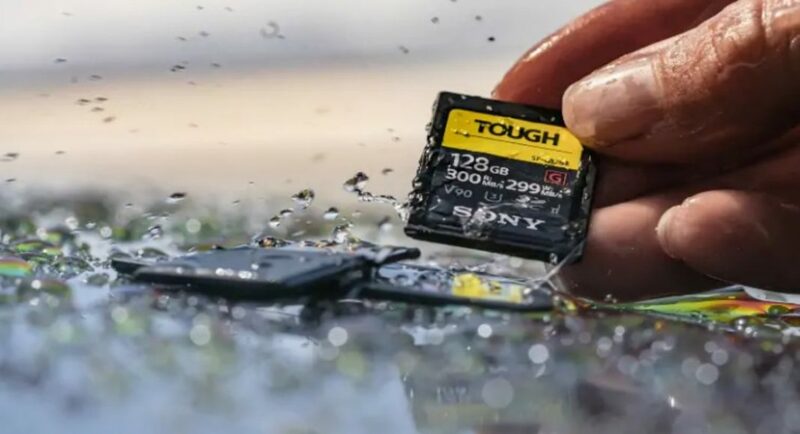 The company is touting its latest offering as the world’s toughest and fastest SD card and it is also said to be the first ever rib-less SD card that comes without write protection switch. The newly launched Sony UHS-II SD card is a part of SF-G series TOUGH specification range and comes in 64GB and 128GB storage variants that are priced at Rs 13,290 and Rs 24,590 respectively. The company has added some enhanced features to its newest SD card that are aimed at professional photographers, videographers and at those who use DSLRs or mirrorless cameras. Sony’s new SD card is drop proof to 5 meters and bend proof to 180N. SD cards in SF-G series TOUGH specification come with IPX8 and IP6X ratings, making them water and dust resistant respectively. The SD cards in the said series also feature a UV Guard and are X-ray proof, magnet proof, anti-static and temperature proof. Sony UHS-II SD card’s read speed is up to 300MB per second and write speed is up to 299MB per second. The SD card also comes with SD Scan Utility and File Rescue Software that enable users to keep their work safe.